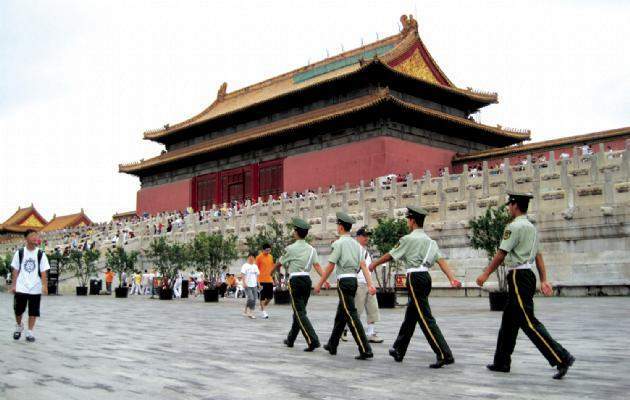 Chinese police march inside the Forbidden City before the 60th anniversary celebration, which was held Thursday. BEIJING – In a country preparing for the onslaught of swine flu, the People’s Republic of China was not about to cancel its massive 60th anniversary celebrations. They took place as scheduled Thursday. As part of a long-range plan for the festivities, the government included flu inoculations, along with parades, pageants and fireworks. As noted in the South China Morning Post on Sept. 9, about 200,000 participants were the first scheduled to receive the vaccine. The plan was made public by Health Minister Chen Zhu. Four other groups would get top priority in the vaccine protocol: students aged 5 to 19, hospital patients, medical staff and, finally, soldiers, police officers and railway, airline and border-control workers. After the 2008 Beijing Olympics, the Chinese have had a year to prepare for their anniversary. On Oct. 1, 1949, Mao Zedong announced the establishment of the PRC. Ever since, there’s been some kind of celebration Oct. 1. The new country began its life in a sea of trouble. Bankrupt, with a crumbling infrastructure, China survived the Japanese invasion and occupation during World War II, only to embark on a deadly civil war afterward. Mao and his Communist Party triumphed over the Kuomintang forces, and Chaing Kaishek fled the country for Formosa, taking with him the entire gold reserve. Industrial production had fallen far below pre-war levels; roads and railway lines were all but inoperable. The nation faced grueling poverty. cruel, periods. But now China is experiencing astonishing prosperity. It’s no wonder the PRC pushed hard to host the 2008 Olympics and put on a big show this year for its anniversary. The biggest difference between the two events is that anniversary celebrations took place all over the country, not just Beijing, and not just the Olympic Village. On a late-summer/early-fall trip to China, I became well-aware of preparations for the 60th anniversary. Banners, newspaper headlines and television spots all trumpeted elaborate planning. I often saw busloads of participants traveling to staging areas for rehearsals. If you’ve ever wondered how the Chinese can recruit, teach and rehearse thousands of young people to perform mass routines, it’s all in the planning. It could only happen in a country with a populace used to obeying orders from on high. Even in remote Tibet, my small group’s scheduled entrance into the Potala Palace had to be delayed by several hours because of a rehearsal. And this was two months before the official anniversary. The biggest events of Oct. 1, of course, took place in Beijing in and around the Forbidden City, the site of Mao’s history-changing announcement in 1949. For more than 500 years, the Forbidden City and its imperial grounds were off-limits to commoners, hence the name. It’s the largest and best-preserved cluster of ancient, imperial buildings in China. Once the private preserve of an emperor and his entourage, the Forbidden City today swarms with thousands of Chinese citizens and visitors from every country across the globe. In a stroke of brilliant urban planning, Mao saw to it that the Imperial City would be linked directly to the great space that represents new China – Tiananmen Square. And so it is. When you leave the Forbidden City, you enter the square – there is no other choice. Tiananmen is the world’s largest public plaza. It sits on a north-south axis directly across Jianguomennei Dajie, a magnificent boulevard that also connects official, commercial and ancient Beijing. Tiananmen Square is a sea of concrete, massively empty to the eye but full of history. Stand in the middle of this enormous rectangular space, and you virtually stand at the center of China. Chairman Mao conceived of the square as a symbol for modern China. It’s flanked by government buildings. Anchoring the south end, Mao’s own Memorial Hall stands; it’s where his body is preserved. When Mao died Sept. 9, 1976, a massive funeral procession took place in the city ending up in the square. Shortly thereafter, the Memorial Hall was completed. In 1989, 13 years after Mao’s death, student protests brought the square to world attention. The image of a single student standing quietly but defiantly in front of a row of tanks has become iconic. When I stood in that vast space, I photographed Chinese families showing their children Mao’s memorial. I also photographed strategically placed police cars. Not surprisingly, last Thursday, a military parade filled Tiananmen and dominated the day’s events. The parade included 60 floats with 200,000 Chinese citizens in various formations marching to the theme: "Motherland and I Marching Together." In the evening, another pag-eant featured mass dance and acrobatic performances plus a fireworks display, not unlike the spectacular Olympic ceremonies. Over the weekend, Beijing’s parks hosted a number of other events. A musical pageant titled "Road to Revival," with a cast of 3,200, was staged at the Great Hall of the People. It depicted the last 169 years of Chinese history. If that wasn’t enough, a gigantic exhibition highlighting China’s progress during the last 60 years opened in Beijing’s Exhibition Center. Planning in a command economy simply is different than anything we know in a democracy. The next time you see a mass demonstration of thousands of Chinese doing the same, elaborate ribbon dance, remember the price that’s paid.